Click here to go back to the Blessing before the Torah Reading. Click here to go forward to the Blessing before the Haftarah Reading. The honor of making the blessing before and after the Torah reading is called an Aliyah​, which literally means "going up." Making the blessings for Torah is a spiritual ascent in which we figuratively go up to Mount Sinai to hear God speaking to us once again. The person who accepts the honor of an Aliyah – called an Oleh (masculine) or Olah (feminine) – is called up to the bimah by his or her Hebrew name. 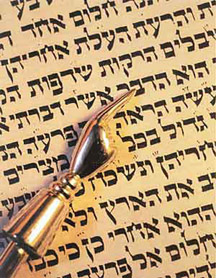 The Oleh/Olah comes up to the Torah reading table on the right side. Standing in front of the Torah scroll, the Oleh/Olah touches the corner of his or her tallit to the beginning of the reading and then touches the tallit to his or her lips. (You can also use the Torah belt). This symbolizes the sweetness of Torah. The Oleh/Olah then takes hold of the wooden posts of the scroll and recites the blessing before the Torah reading. The words of the blessings are printed on a large laminated sheet in Hebrew and in English transliteration. After you recite the first sentence of the blessing the congregation will recite the second sentence. You will then repeat the second sentence before continuing with the blessing. Following the recitation of the Torah, the Oleh/Olah again touches the scroll with his or her tallit at the end of the reading, touches it to his or her lips, takes hold of the wooden posts, and recites the blessing after the reading. Following the blessing, the Oleh/Olah steps to the other side of the Torah reading table to make room for the next Oleh/Olah and stays on the bimah until the end of the next Aliyah. Before returning to his or her seat in the congregation, the Oleh/Olah shakes hands with the other people on the bimah. ​People will say to the Oleh/Olah, "Yashar Koach" ("May you go from strength to strength"). The traditional response is "Baruch Tih'yeh" ("May you be blessed").